Woolworths has been named Australia’s most valuable brand with a total brand value of over US$10 billion dollars – a first for Australia, according to The Brand Finance’ Global 500′ released today. Rival Coles has also increased it’s total brand value to just over US$6 billion, but is still ways behind its supermarket counterpart. It was telco Telstra, which has shown the largest growth of any Australian brand recording a 37% growth to a total brand value of US$8.3 billion leap frog over BHP Billiton who comes in at third on the list. 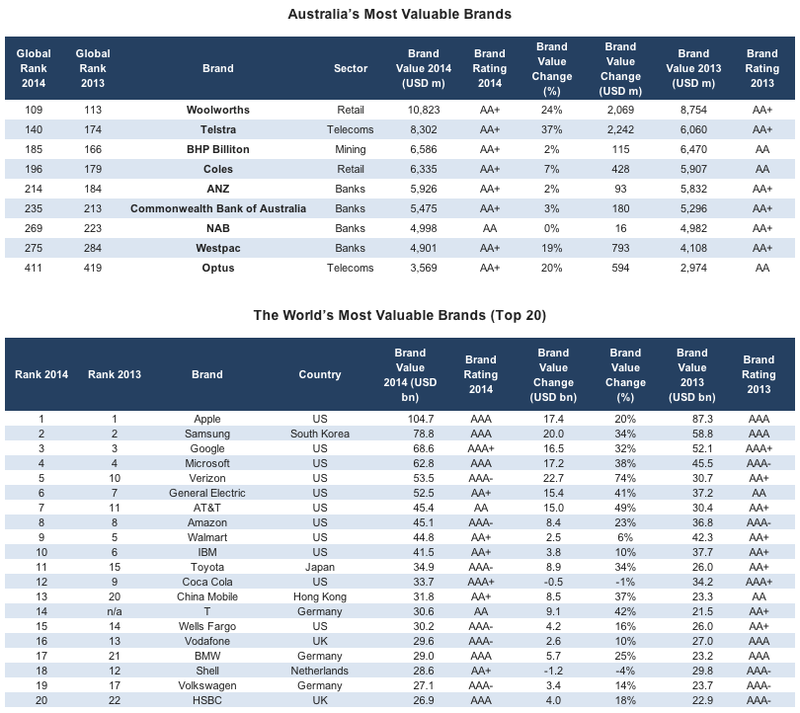 Globally, Telstra has become one of the top 20 most valuable telecoms brands for the first time. The operator has retained its advantage in network coverage over Optus and continues to leverage its brand effectively through its triple-play and broadband offering. A 9.2% growth in profits has led to an increased dividend this year for the first time since 2006. ANZ was named Australia’s most valuable bank brand with a brand value of US$5.9 billion, its ‘Asian strategy’ is proving successful; ANZ sponsorship hit the jackpot this year with Li Na’s win at the Australian Open (as a result an estimated 70 million Chinese viewers were exposed to the ANZ brand). NAB is the only Australian brand in the Global 500 not to show at least moderate growth. An increase of US$16m barely registers and sees NAB fall 46 places down the global rankings from 223rd to 269th. Westpac, though the fourth most valuable Australian bank brand in this year’s global 500, showed the most impressive growth (19% against ANZ’s 2% and CBA’s 3% and NAB’s 0%) and will be looking to continue this strong performance through 2014.